SINCE the earliest issues of “Rugby League Journal” some of our keenest readers have been asking if they could show their support for our efforts via some kind of sponsorship scheme. And now the time has come when that kind of support is necessary, so we are launching a “Friends and Patrons” group and inviting all those who are able to make a sponsorship donation to do so. We are doing this so we can ensure that we continue to provide a high quality magazine that helps preserve the history and heritage of Rugby League - effectively we are asking you to help us keep the memories alive. “Rugby League Journal” is purely a labour of love and everybody who contributes does so totally in a voluntary capacity - they do it because they care about keeping the memories alive. Our cover price has stayed at £2.50 since we began and is considerably less than other sporting publications, and even less than most club programmes. However, rising costs of production, postage and distribution really mean that we should increase the cover price - but, we don’t want to do that because we know a lot of our regular readers who get the most pleasure from “Rugby League Journal” are pensioners and people on low incomes. So, by introducing the “Friends and Patrons” scheme, we are only asking those readers who can afford to give this extra support to do so - thereby ensuring those who cannot afford it will not have to pay extra for their magazine. We are inviting you to sign up as a “Friend of Rugby League Journal” for a minimum donation of £10; or a “Patron of Rugby League Journal” for a minimum donation of £25. Those who do this will have their names (and it can be a business name or organisation if you wish) printed in a special section at the front of every issue of the magazine. You also have the option of dedicating this in memory of somebody who has passed away. Your sponsorship will effectively be for one year at a time, thus your name will be included for four consectuive issues, before you will have the option to renew or not. 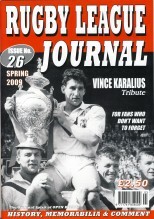 Rugby League Journal, P.O.Box 22, Egremont, Cumbria, CA23 3WA. All sponsors will be acknowledged and you will have the gratitude of all our readers. With thanks - and looking forward to having you join us.